From this perspective, Michelle Obama’s campaign for gardens and clean, organic, nutritious food is nothing more than a diversion, a cover story floated to obscure what her husband has actually been doing. We are talking about a president who presented himself, and was believed by many to be, an extraordinary departure from politics as usual. Not only was that a wrong assessment, Obama was lying all along. He was, and he still is, Monsanto’s man in Washington. This entry was posted in GMOwar, Government Fraud. Ahhhhh… Barrack and Michelle doing the Ronny and Nancy Reagan ‘just say no’ routine. Why has Hollywashingtonhood run out of plots? They keep rewriting old scripts. bites a test tube child with three parents, who eats GMO’ed Fruit Loops every morning while doing their Common Core mathematics problems. Before going to school to line up for a GMO’ed vaccine against MERS. BTW Loved the last post Jon. Love and postcards from the edge. The joke is the pucnh line…right to that child’s brain. What’s new? A one party system works for the grand Masters eh? 20 years of FDR gave Aristocracy plenty of time to entrench state socialist power in the hands of old money oligarchy. Nice. King Barack lies when the truth will serve him better. He’s SO comfortable lying that he doesn’t even bother to think about what he says anymore. He knows that the banker-controlled media will play along with whatever spills out of the toxic hole above his chin and that the bovine American public are too stupid and distracted to see it for the treasonous verbal diarrhea that it is. Monsanto food is rumored to make you sterile. Good article. Thank you. Obama is a strict conservative and ran as a Trojan Horse for Conservatives and the Republican Party. Look closely how he despises Warren and Sanders and the Progressives in his own party. You actually believe that? I’ve heard some strange theories in the last six years, but this one takes the cake! You have access to the Internet, the library and Common Sense, and you actually believe that? Trojan Horse absurdity aside, you STILL think that it’s all about Democrats and Republicans? You read writers like Jon Rappaport and you’re STILL thinking inside THAT box? This goes well beyond the corrupt two-headed-beast-psycho-drama in Washington DC. Obama doesn’t care about ANYTHING other than his responsibilities to the criminals who hold his leash AND the feeding of his own narcissistic lust. AND he despises anyone and everything that gets in the way of it. The right/left paradigm is a fallacy. The sooner everyone realizes this the sooner we can get the change needed. A very important article by Jon Rappoport. Some of this is not news, but when you see the fully developed patterns the message and conclusion are clear. I have always believed that “Michelle Obama’s campaign for gardens and clean, organic, nutritious food is nothing more than a diversion, a cover story floated to obscure what her husband has actually been doing.” I’m not happy to be right about this state of affairs, but am pleased more and more people are waking up to it. smart business development that’s a win-win for everybody,” a new level of corporate-government colonialism is aimed at the continent of Africa. I remember that a famous South African writer calls it ” Genetic Colonialism ” . And I say the ” Gene Revolution ” is far worse than the old ” Green Revolution ” . And finally I want to say that Jon, you’re one of the very few journalists who have pointed out that Obama was actually a secret Monsanto and Big Agribusiness agent from the very start of his presidency. And an article from Organic Consumers Association revealed that Romney was a new lawyer for Monsanto way back in 1973 : not only 20 years before the first genetically engineered food on the market but also in the first year that the science of genetic engineering was discovered by 2 scientists : 1973. 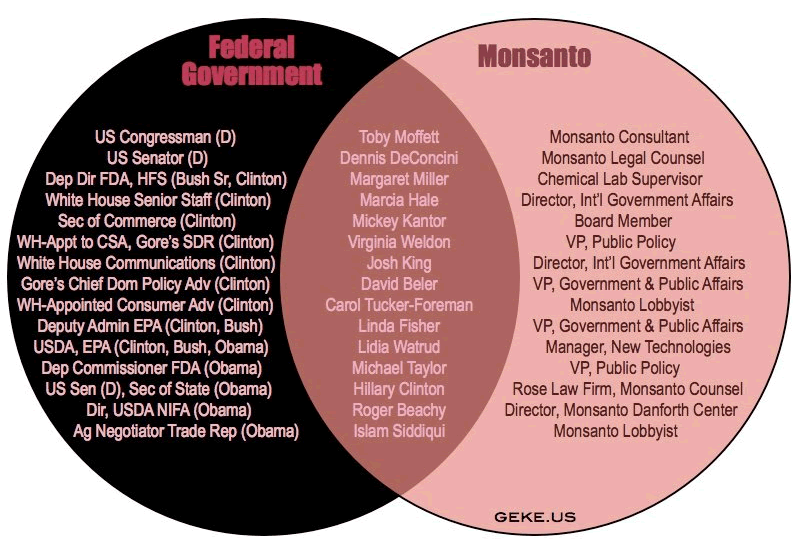 So in the 2012 election, Obama and Romney were both stealth Monsanto lawyer candidates. Needless to say, Mainstream Media didn’t have a word to say about this, all through the election in 2012. But we have an underground media and activists. Why weren’t they screaming bloody murder about this fact, if they knew it ? Activists should have been raising this issue of the Monsanto – Agribiz connection every chance they got. I know I raised this issue to my friends, who didn’t care much. Activism is pretty non-existant in my part of the country. There was a large consensus that as bad as Obama was, at least, poor people could eat under Obama. Romney and the Republicans would have cut off food stamps so that poor people couldn’t even eat and there would have been riots. I’m still mad as hell that these 2 stealth Monsanto candidates weren’t exposed during the 2012 election for President of the USA.